The gospels are a minefield: If you step on the wrong verses, your idealized Jesus gets blown to bits. For example, in Matthew 10 we are told that Jesus dispatched the disciples to do some preaching, with this caveat (v. 5): “Go nowhere among the Gentiles, and enter no town of the Samaritans…” And later, in chapter 15, he told a Canaanite woman who asked for help, “I was sent only to the lost sheep of the house of Israel” (v. 24). He even compared her to a dog. Happy ending, however: When she persisted, he performed a long-distance exorcism on her daughter. 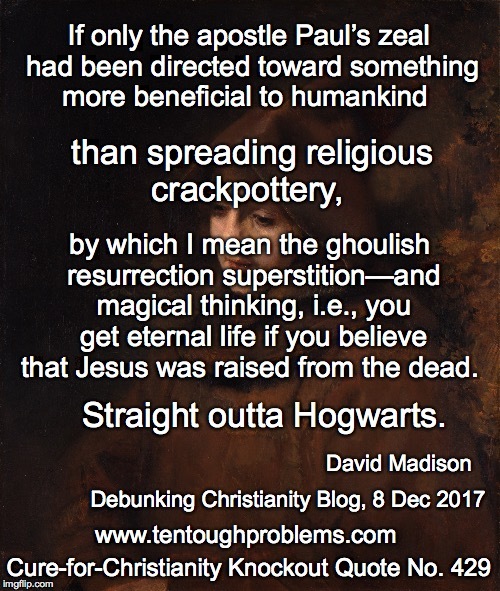 Did Jesus really say these things? Who knows. Since our chances of having the authentic words of Jesus are slim to none—given the composition of the gospels decades after the fact—we are confined to analyzing what the gospel writers thought he said—or imagined he said. We’re reading Matthew’s script here (and in another post I have written about how unreliable he was). Most Christians cherish the universalist Jesus who reached out to all, as represented in Matthew 28:19, the so-called Great Commission: “Go therefore and make disciples of all nations, baptizing them in the name of the Father and of the Son and of the Holy Spirit…” Since this comes from the lore about things Jesus said after he died—but was newly alive—we can be suspicious. Everything about the resurrection accounts should make us suspicious. But we do know for sure that one of major tensions in the New Testament is rooted in the contrasting messages of Matthew 10:5 and 28:19, i.e., who is the target audience for the Christian ‘good news’? Was Jesus’ message about the Kingdom of God—which was expected before ‘this generation passes away’—intended for Jews only, or for the wider world, as the Great Commission would seem to suggest? However, for the apostle Paul, who never knew Jesus, this issue wasn’t up for debate. He would have flatly rejected the stories that Matthew wrote decades later about Jesus avoiding gentiles. Paul didn’t need any gospels to tell him about Christ. He knew his lord through his own visions, and was driven by these hallucinations to preach Christ to the gentile world. This was his mission and passion, and he explains it in his letter to the church at Rome, chapter 15. We are up to this chapter now in the tour of Romans that I have offered in previous posts this year. • Paul was speaking about those who got into the cult, “for all of you are one in Christ Jesus.” Galatians 3:28 cannot be taken as an affirmation of democratic egalitarianism: Gee, everyone is equal. That was the last thing on Paul’s mind; as we know from Romans 13, he strongly endorsed authoritarian government. Paul believed there were no barriers when it came to “belonging to Christ”—no matter who you were, Jew or Greek, slave or free, male or female—as long as you believed that Christ was raised from the dead, you were among the remnant to be saved. • And it’s such a shame that he was driven by hallucination-based delusions; his passion, his intensity convinced a lot of people that he was tuned into God. He welcomed the gullible in all categories. His jabbering about Christ is abundantly on display in chapter 15: “I will not venture to speak of anything except what Christ has accomplished through me…” He was someone else’s puppet. Who talks like this but someone who has lost touch with reality—who is in touch only with the fantasies bouncing around in his own head? Distrust anyone who has gone so over the edge with hero worship and devotion to imaginary beings who manipulate our lives. Preachers love to talk like this, but when has the first wish, expressed in verse 5, ever come to pass? 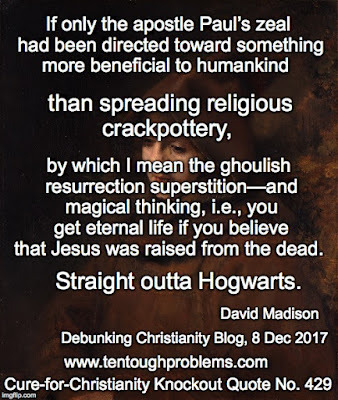 If only Paul’s zeal had been directed toward something more beneficial to humankind than spreading religious crackpottery, by which I mean the ghoulish resurrection superstition—and magical thinking, i.e., you get eternal life if you believe that Jesus was raised from the dead. Straight outta Hogwarts. This package of belief has become so normalized that pious folks don’t see how bizarre it is. Scholar Ben Witherington III displays typical Christian myopia; he dedicated his 400-page commentary on Romans to a pastor who was “a very present help in difficult times, and a very able expositor of the Good News which Paul brokered for Gentiles like us.” What a disaster for Western thought that he did. Sorry, Paul’s life, fanaticism and message fall far short of being Good News. The factions represented in the New Testament were trying to work out how the gentiles could fit into the new cult. When Matthew wrote that Jesus didn’t want his disciples preaching among the gentiles, he was perhaps voicing resistance to Paul’s endeavors. But why does the Jew-Gentile dichotomy even exist? Because once upon a time, one tribe became convinced that it was the “chosen people”—and was willing to massacre other tribes to grab their holy land. This phenomenon has been repeated endlessly in the history of religion. The concepts Chosen People and Holy Land have brought endless strife and bloodshed. Paul really cannot be hailed as a hero because he embraced the gentiles. Once the remnant was gathered—those who belonged to Christ—then everyone else fell outside the scope of God’s love. A careful reading of Paul’s letters shows that he believed God’s default emotion was wrath; for those who remained outside the cult he was actually Bad News Paul. My curiosity: the Christian scholars who can’t get enough of Paul, churning out endless books, articles, doctoral dissertations—analyzing every last syllable he wrote—why can’t they just give it a rest?